Keeping track of debts and payments before accounting was invented. 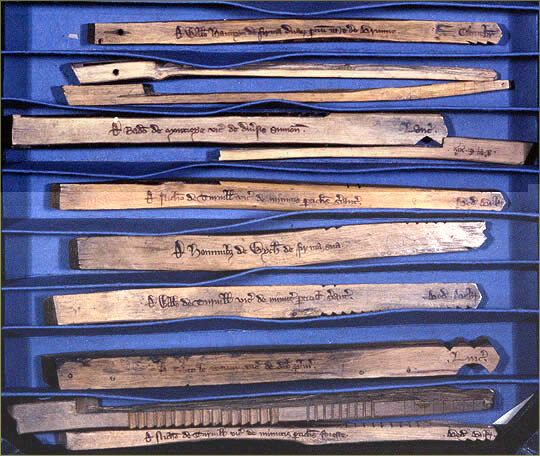 Tally sticks are an ancient mnemonic device (memory aid) to record and document numbers, quantities, or even messages. While the origin of this technique is lost in prehistory, archaeological proof of the existence of such devices is ample. One of the most famous ancient artifacts is the so called Ishango Bone. The oldest known device is the Lebombo bone and is dated from 35,000 BC. Historical reference is made by Pliny the Elder (23 - 79 AD) about the best wood to use for tallies and Marco Polo (1254-1324) who mentions the use of the tally in China. Principally there are two different kinds of tally sticks, the single and the split tally. The single tally stick is an elongated piece of bone, ivory, wood, or stone which is marked with a system of notches (see: Tally marks). The single tally stick serves predominantly mnemonic purposes. Related to the single tally concept are messenger sticks (e.g. Inuit tribes), the knotted cords - khipus or quipus - as used by the Inca. Herodotus (485 (?) – 425 BC) reported the use of a knotted cord by Darius I of Persia (521 (?) – 486 BC). The rosary is a remnant of the technique represented in the knotted cord. The split tally is a technique which became common in medieval Europe which was constantly short of money (coins) and predominantly illiterate in order to record bilateral exchange and debts. A stick (squared Hazelwood sticks were most common) was marked with a system of notches and then split lengthwise. This way both of the two halves record the same notches and each party to the transaction received one half of the marked stick as proof. Later this technique was refined in various ways and became virtually tamper proof. One of the refinements was to make the two halves of the stick of different lengths. The longer part was called stock and was given to the party which had advanced money or (other items) to the receiver. Hence the word stockholder. The debtor, on the other hand, "got the short end of the stick". Thus, this modern expression for being the loser in any transaction. The shorter portion of the stick was called foil and was given to the party which had received the funds/goods. Using this technique each of the parties had an identifiable and tamper-proof record of the transaction. The split tally was accepted as legal proof in medieval courts and the Napoleonic Code (1804) still makes reference to the tally stick in Article 1333. Along the Danube and in Switzerland the tally was still used in the 20th Century in rural economies. "The manner of cutting is as follows. At the top of the tally a cut is made, the thickness of the palm of the hand, to represent a thousand pounds; then a hundred pounds by a cut the breadth of a thumb; twenty pounds, the breadth of the little finger; a single pound, the width of a swollen barleycorn; a shilling rather narrower than a penny is marked by a single cut without removing any wood". Royal tallies (debt of the Crown) also played an infamous role in the formation of the Bank of England at the end of the 17th century when these royal tallies – trading at a hefty discount of up to 60 percent – were engrafted into the Bank’s capital stock . The tally in various countries is called: Germany: Kerbstock or Kerbholz / Greece: symbolon / France: taille or bâtons de taille / Italy: taglie di contrassegno / Switzerland: Degen or Alpscheit or Tesslen or Tesseln or Beigli or Beile or Tessere / Spain: talla or tara or tarja / Austria: Raitholz or Rechenholz or Robi(t)sch / Sweden: karvstock; Hungary: rovás; Latin: tessera or tallia or talea. T.W. Baxter: Early Accounting, The Tally and the Checkerboard, in: The Accounting Historians Journal Vol. 16, (1989), pp. 43-83. Hilary Jenkinson: Medieval Tallies, Public and Private, in: Archaeologia or Miscellaneous Tracts relating to Antiquity, published by the Society of Antiquaries of London, 74 (1924), pp. 289-351, 8 Plates. This article is licensed under the GNU Free Documentation License. It uses material from the Wikipedia article "Tally Sticks". 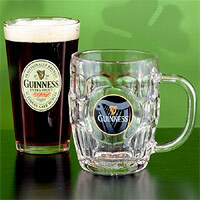 An Irish man shows up in a Boston pub one day and orders two pints of Guinness. He takes sips from each glass until they are empty and calls the bartender for two more. The bartender says, "Sure it's up to yourself, but wouldn't you rather I was bringing them one at a time?" "Nah..." your man says, "I'm preferrin' that ye bring 'em two at a time. You see, me and me Da would meet at a pub and drink and have good times. Now, I'm here and he's in Ireland. We agreed before we split up that we'd drink to each other's health every day this way." "Aye," says the bartender, "that's a grand thing to do, all right." Well, time goes on and your man's peculiar habit is known and accepted by all the pub regulars. One day though, he comes in and orders only one pint. A hush falls over the pub. Some of the regulars cross themselves and offer a blessing for his father. A group of them beckon to the bartender and persuade him to find out what happened. With a heavy heart, the bartender brings the single pint and says, "Here's your pint, son... and may I offer me sympathy. What happened to your Da?" If you want to add this article to your list of favorites or email it to a friend, please use this permanent URL, https://stores.renstore.com/-strse-template/0703A/Page.bok. Permission is granted by the author to quote from this page or use it in handouts as long as you include a link back to Renstore.com.